EMAG exists to campaign for full government compensation. Will members of EMAG please note that because of pressure of work we regret it is not possible to answer individual written enquiries. A short video which explains what EMAG is fighting for. “...If the state fails to regulate properly, it inevitably forces that cost on to the consumer, and it is incumbent on the Government to make that right—and make it right in full. “The ombudsman was clear that there were fundamental failings by the then Department of Trade and Industry, the Government Actuary's Department and the Financial Services Authority. The truth is that they knew, for most of the time, that this was a fraudulent Ponzi scheme. “The ombudsman called on the Government to fully compensate the victims: to put them in the position they would have been in if the scandal had not occurred. That is the test: where would they have been if this scandal had not occurred? Leaving aside the pre-92 victims, that is a far cry from the 22p in the pound that has, in effect, been paid to many of those whom we have chosen to compensate. As has been said, this ultimately comes down to an issue of public trust. These victims were not wealthy investors. “Typically, in my constituency at least, they were retired factory workers, teachers, nurses and small businessmen, who believed they were setting themselves up for at least a tolerable and reasonable ​retirement — I was tempted to say a comfortable one. That is a perfectly honourable, reasonable and laudable ambition for all our citizens. “As my hon. Friend made clear, the Conservative party promised in our 2010 manifesto to compensate the victims—not partially compensate them or compensate some, but compensate them. Like him, I was a signatory to that—indeed, I was heavily involved in getting it to happen. So I feel personally committed to it, too. It was right there in black and white, and it is there with my signature on it, just like everybody else's. A failure to right this wrong will only serve to further undermine the public's trust in politics and financial institutions. Many thanks to all those EMAG members who asked their MP to participate in our debate on 31st January. Despite the very short notice, more than 30 MPs spoke in the house and others sent their apologies as they were unable to attend. MPs were unanimous in their support for EMAG's campaign and many spoke passionately about the injustice we continue to suffer. The government were left in no doubt that we have very strong support throughout the house. Minister John Glen's response was predictable and written in advance without hearing the debate. It repeated the Treasury's mantra of “no more money”. His position was very weak. The best he could manage was to claim credit for paying more than Labour would have done back in 2010. Transcript of the debate at here. See also video clip excerpts from the Equitable Life compensation debate on twitter: www.twitter.com/EMAGnews. Now numbering over 250 members, drawn from all political Parties. There are more Labour MP members than Tories (96). EMAG's new “outward facing” campaign website is ready at www.emag.today. It includes some simplified information on the campaign and several video clips featuring EMAG members. 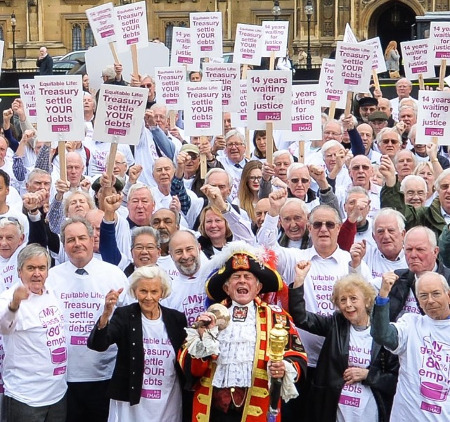 EMAG will campaign until fair compensation is awarded to the million victims of the Equitable Life scandal. 95% of Equitable's with profits policyholders have received just 22% of the Treasury's calculation of their ‘relative losses’ without any interest paid from 2009 onwards. 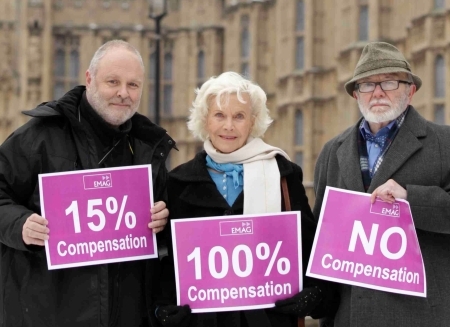 With the economy at last recovering, we are campaigning for a commitment that victims will receive the missing 78% of their compensation entitlement. 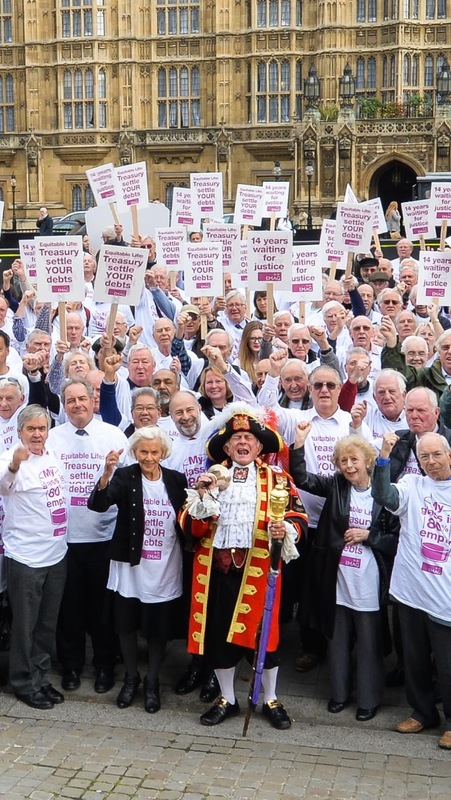 We are campaigning to get MPs to insist that the 10,000 pre–September 1992 WP Annuitants are compensated on exactly the same terms as those who took their WP Annuity after that date. We view the current flat rate £5,000 as a welcome down–payment. For the 37,000 WP Annuitants who are receiving an alleged ‘100% of their relative losses’ we are seeking dialogue with The Prudential to see why annuity payments continue to fall every year.